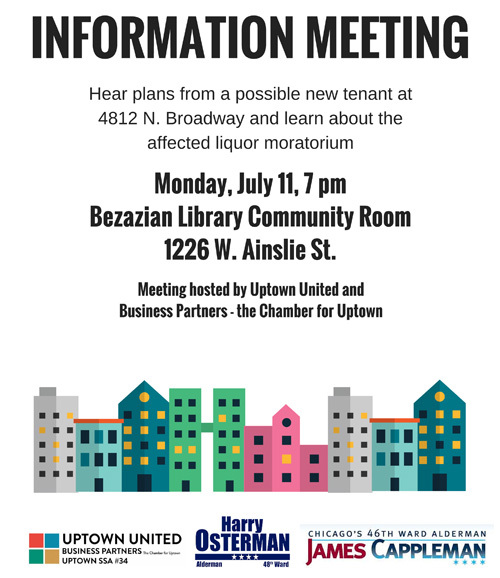 There will be an informational meeting next Monday to discuss potential new tenants for the former Shake, Rattle & Read storefront next to the Uptown Theater. Rumor has it that a high-end wine shop wants to open there. Great news, right? Well, not so fast. 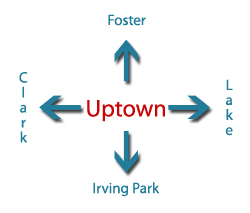 That part of Uptown is under a package liquor moratorium, which means that businesses in the area can sell liquor to be consumed on the premises, but cannot sell it in containers for patrons to take home. The moratorium area is considered one complete area, and the ban on packaged sales can't be lifted piecemeal. In other words, lifting the moratorium to allow a high-end wine store at 4812 Broadway also opens the door for liquor stores to open anywhere on Broadway between Argyle and Lawrence, including the large strip mall across from the Post Office. Additionally, there are several empty/underdeveloped lots in the moratorium area that may be development targets in the not-too-distant future. 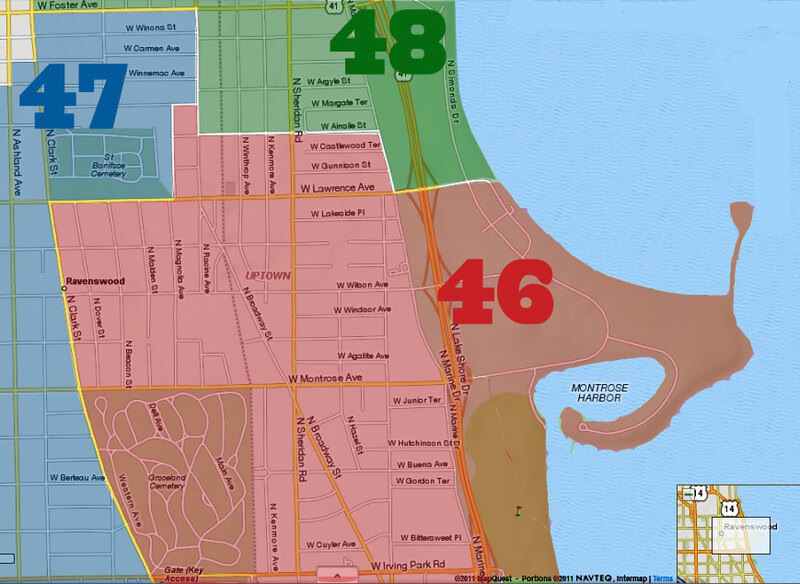 If the liquor moratorium is lifted, there is the added potential for bottled liquor sales in those locations as well. That's a lot of area to open up to liquor sales so that one business can get the go-ahead, no matter how attractive a neighbor it may be. 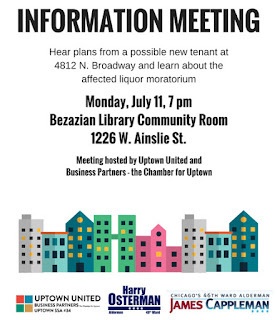 We would love to see a high-end liquor store come to Uptown, but we also acknowledge that there are plenty of other locations for it that wouldn't involve lifting a large, and historically successful, package goods moratorium. If you are interested in this issue, please come to the information meeting on Monday. Would lifting this ban have any effect on a brewery setting up shop in the area? Hope it happens - this rule is outdated just like prohibition. If wine shops in Lakeview/Buena Park are indication -- it won't work. Two of them closed along Broadway this year. Please detail what ones closed. Lianna, you might take a look at North Buena Deli and Wines for a case study closer to home. Why was there a moratorium put in place to begin with? There are many packaged liquor moratoriums all over the city. Usually because public drinking is problematic and/or the community doesn't want liquor stores in the area. 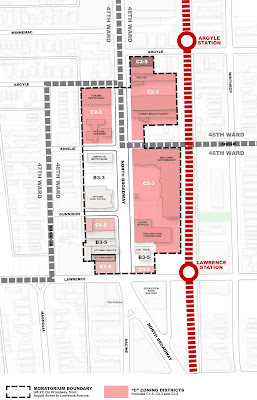 Most of Sheridan in Uptown is a packaged liquor moratorium area, as is Wilson Avenue east of Broadway. Are we trying to cultivate an atmosphere similar to the one outside JJ Peppers on Lawrence?